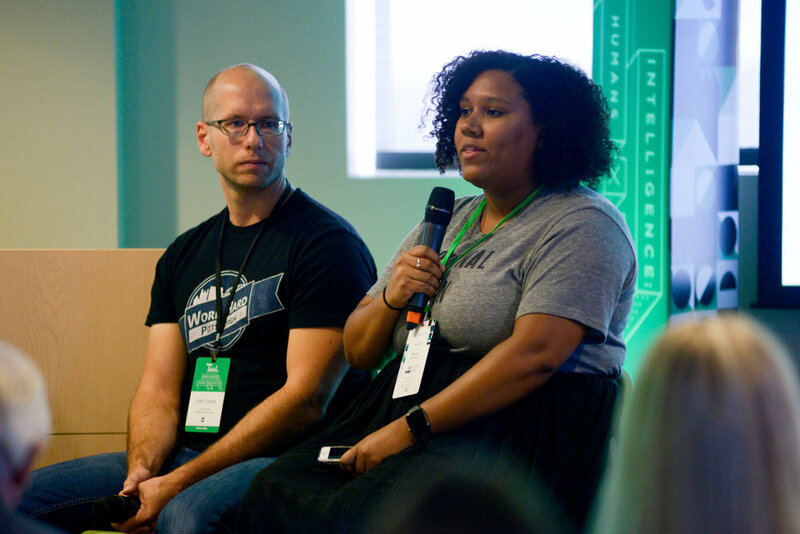 Jennifer Van Dam (R), Digital & Community Engagement Manager at Innovation Works, and Josh Lucas (L), Founder of Work Hard Pittsburgh, talking about diversity in tech culture. The reach of technology is vast. It’s everywhere, often embedded in places we do not suspect. And while it’s designed to work for users, occasionally it feels as if humans instead serve technology with so many apps, devices, media and experiences demanding their attention. 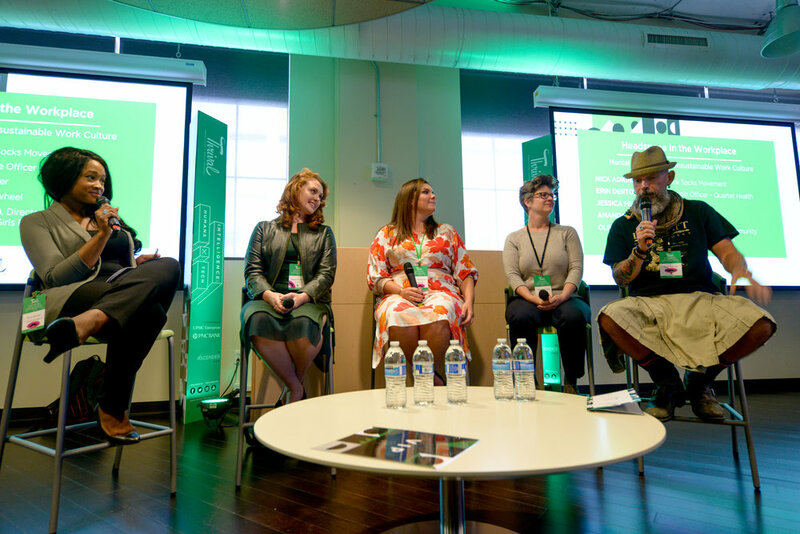 On the second day of Thrival Innovation at the Ace Hotel in Pittsburgh, a number of panels examine and discussed the human element in technology, especially at the dawn of the Age of Artificial Intelligence. Are Virtual and Augmented Realities the Future of Advertising? At the day’s first panel, It’s Not Just About the Tech: Knowing Your Market & Effective Brand Communication, Sheel Mohnot, Partner at 500 Startups, told attendees that he is a bear when it comes to virtual reality. How long, he mused, would users stay inside a virtual reality, both for technological deficiencies (resolution, for one) and others? Augmented reality, Mohnot believes, has more capabilities, particularly with the new iPhone, which Apple designed with AR in mind. For him, users and businesses could benefit if users, for instance, could use their phone to demo new furniture in their home, or to try on new glasses remotely. He also believes that instead of VR, people will be using voice command technologies, with their accompanying hardware, like Alexa and Siri more and more. Panelists discussing the future of marketing and branding. Brian Monahan, Head of Vertical Strategy at Pinterest, foresees more users being more engaged in visual discovery. At Pinterest, for instance, new mobile devices and cameras will allow users to take a photograph, upload it, and get recommendations returned to them via the platform. For him, navigating a world without words is powerful and the future. The panel’s moderator always addressed marketing on blockchains. As he sees it, this type of marketing is still aw ays off, as marketers need to feel comfortable “working inside that house”, as he said. Mohnot, for his part, doesn’t believe that much of users’ private information will be available on public blockchain spaces for quite some time, which would also delay marketing and brand development on the relatively new technology. Robots Don’t Care, But You Do? The day’s second panel explored the design of technologies and platforms for “actual humans”. Panelist Kristi Woolsey of MAYA Design, a design consultancy and technology research lab, noted that reputation management will become important. People, especially at a young age, will be taught that their actions and posts on social media platforms will impact their reputation, and that it will become important to create a positive brand on social media instead of a negative one. Woolsey also believes that finding value in actual human interaction will have to be emphasized going forward, not just on social media interaction. Sara Diepenbrock, Senior Brand Manager a Procter & Gamble’s Olay Skincare North America, said that brand managers will have to think about trust issues. Users are putting personal information on platforms, and they are trusting businesses to keep them secure. Kristi Woolsey (L), Sara Diepenbrock (C), and Alex Deans (R) discussing the design of things for actual humans. Building on Diepenbrock’s thought, Minette Vaccariello, Lead Design Strategist at UPMC Enterprises, noted that the healhcare industry has constraints with patient data. She said there are misconceptions about how healthcare and insurance companies use that data, so the companies need to be transparent about data usage and insist that employees talk about it amongst themselves and with patients. For the third talk, the panelists, moderated by Olivia Benson, Director of Community Engagement at Women & Girls Foundation, explored mental health in the work place. 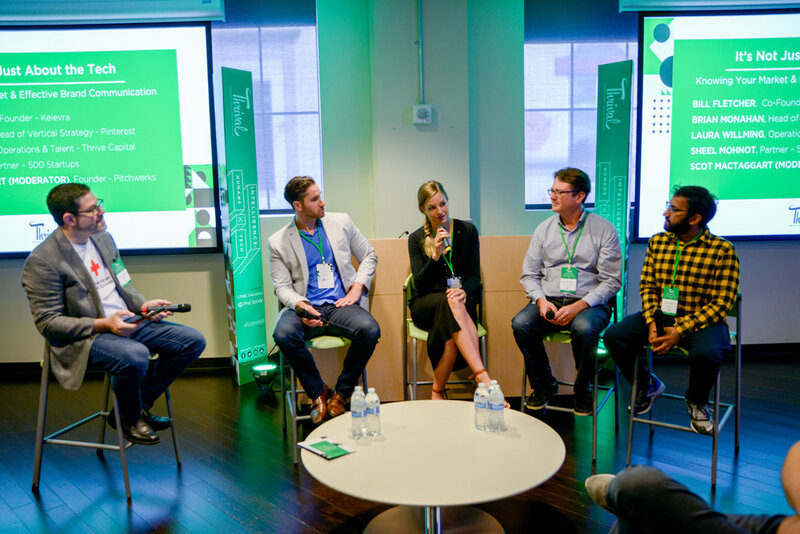 The panelists agreed that a work culture, particularly in the competitive startup space, that approaches 100+ hours per week, is ultimately unsustainable. As Erin Dertouzos, Chief People Officer at Quartet Health, told Thrival Innovation in a short video interview, that her company uses data to identify patients who are at a high risk for mental health problems and connect them to the right healthcare to produce and measure better outcomes. 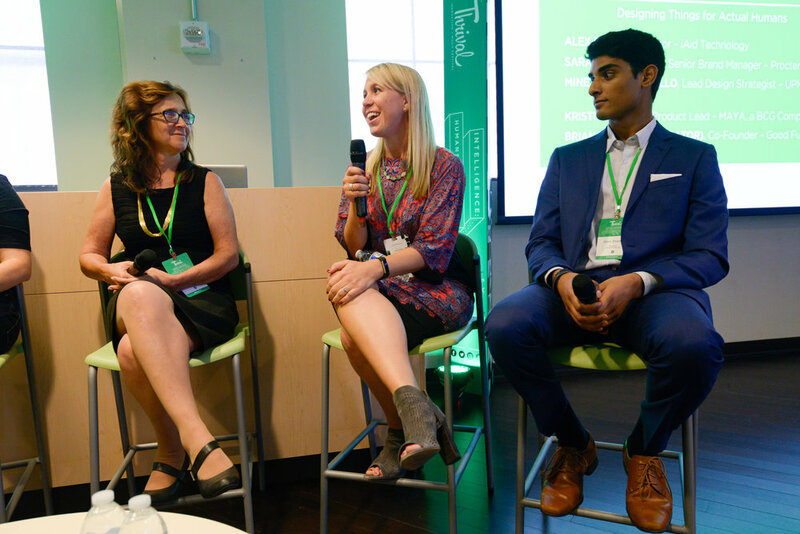 Headspace in the Workplace panelists talk mental health amidst an unsustainable work culture. Panelists also discussed the virtue of taking a week-long vacation every quarter to maintain a healthy headspace in the workplace. Dertouzos also recommended taking frequent breaks and walks to clear the head and foster “creative juices”. The group also talked about volunteering their time for a specific causes as way of decompressing from the work place and maintaining positive mental health. Both San Francisco and New York’s tech cultures are dominated by men, and largely white. The panel Tech Culture Re-boot: Diversity, Equity, & Our Evolving Ecosystems attempted to discover what Pittsburgh could to do foster a more inclusive and diverse startup culture. The panel recommended that attendees not be afraid to talk to people who might not look like them, as well as visit places that wouldn’t typically frequent. Expanding one’s various social circles is, of course, another great antidote to lack of diversity.